It’s hard to believe that just at the start of this month, I’d never done a fondant cake before because I was too scared and now here I am two weeks later doing my second. I wasn’t even planning on doing it. The opportunity just presented itself. Last week, my boss said she wanted to do a little cake celebration for my co-worker on Monday. I volunteered to bake a cake since I still had tons of black fondant leftover from my Hunger Games cake. A misunderstanding occurred and Monday morning I got up to bake the cake. As the layers cooled in the freezer, I checked my email and saw one from her saying she’d bought a cake. Ugh. I called her to tell her I hadn’t frosted it yet, so we could just use hers and my family could eat the one I made. I put the pans in the fridge and on the way to work, it occurred to me that although I hadn’t meant to start on my Final Fantasy Fan Art Contest entry for another couple of weeks, this cake could just be done up as that cake with what I had on hand. I only had a vague plan in mind, but since winging it is my thing, I decided to start that night. The first thing I had to do was assemble the cake and cover it with fondant. I was nervous, since every cake I’d ever layered turned into a mountain somehow. I’d used my Wilton Cake Leveler to cut the tops off while they were still in the pan and it worked wonderfully. Amazingly, the cake looked great layered. I used the leftover Safeway frosting and covered the whole thing to get a good shape. I rolled out my white fondant before realizing that I would need all that white to make the figures. I folded up the fondant and put it away and took out the black. I had a whole tub left from the Hunger Games one, which was more than enough. I laid it on top and folded the sides down. I still have to get the hang of doing this on a circular cake, as I had some bumps. I used a toothpick to cut away the extras. After slicing off a whole side from the last cake, I wasn’t about to use a knife again. Somewhere along the way, I came up with the idea to put another mini cake on top that the figures I built would surround. I took the leftover tops and mashed them together with from frosting and molded it into a cake shape. I rolled out white fondant and topped this cake, then placed it in the center of the main cake. Now it was time to start on the figures. I rolled out a mandragora head from white and then cut out two green leaves. They are curled, so I wrapped them around some cooking chopsticks. Then I remembered I should add lines and then pressed those in with a toothpick before putting them back on the chopsticks to harden up a bit. I poked a hole in the top of the head with the flat end of a toothpick, then rolled a thin strip of green and after filling the hole with piping gel, stuck the green strip in. I cut off most of it and now had a mandragora head with a stem and two curled leaves. I used an oval cutter to cut out the black oval and glued it on with piping gel. I colored some fondant with brown icing color and then used a cutter to cut out a circle. I used a toothpick to cut out the little slit at the top. I then used the flat top of the toothpick to make the little circles and then used the tip to make the stitch lines. I rolled two tiny balls of white and squished them to make his eyes. I molded his body, shirt, and arms. His body was way too big! To solve this problem I had him sit down on the cake. Adding his feet was a ton of fun. I simply squished some black onto the tips and smeared it up and they looked like boots. I tried and tried and could not get the fondant to be gray. Turns out that black fondant is probably made out of chocolate and so mixing it with white just make it brownish black. I decided to just let that detail slide. I made a rough shape, not caring to smooth out the creases because goobbues have lots of flabby wrinkles in their body anyway. I streeeeetched his arms out far, gave him moobs, glued little brown eyes on, and poked holes in his head. This would be for the little grass shoots. I rolled out tiny strips and folded them in and and then stuck on two tinier strips and that’s how I got the grass shoots. I stuck piping gel inside and inserted the shoots into the holes. Next up was the bomb. I colored some white fondant with Christmas Red and then as I was trying to shape him, got the idea to make him hollow. This really helped with doing his top pointy flames. Eventually though, I realized that I needed to fill the center and so I stuck a ball of white inside. Bombs have stubby little arms, so I formed them and then used a toothpick to make fingers. Here he is from the front, all ready for face paint! First up was the mouth. I cut the mouth out with an oval, then used that same oval to cut the shape I needed. I cut out teeth with a knife and glued them on with gel. I cut out the eyes and eyeballs with the oval cutter and a knife, then added two small balls for pupils. His teeth were a bit too small, but at this point I was getting sleepy and so decided to let that part go. Little did I know that I would be working for five more hours. I colored more brown, then used some old nightlock berry fondant for his ears. I used the flat of a toothpick to make holes for where the eyes would go. The ears kept falling off so I propped them up with cutters that I would use to cut out the letters for HAPPY 9TH ANNIVERSARY. I added the gobbie eyes and then made the marks with a toothpick. As you can see, toothpicks are invaluable with fondant. After I made the head, I realized that his head was so big, there was no way I could make the whole goblin and maintain some kind of scale, so I decided to just do the head and make it a gobbie mask. I glued the letters on and then added the four figures I’d already made. I had to put toothpicks into the goobbue’s legs to keep him upright. The same went for the bomb. 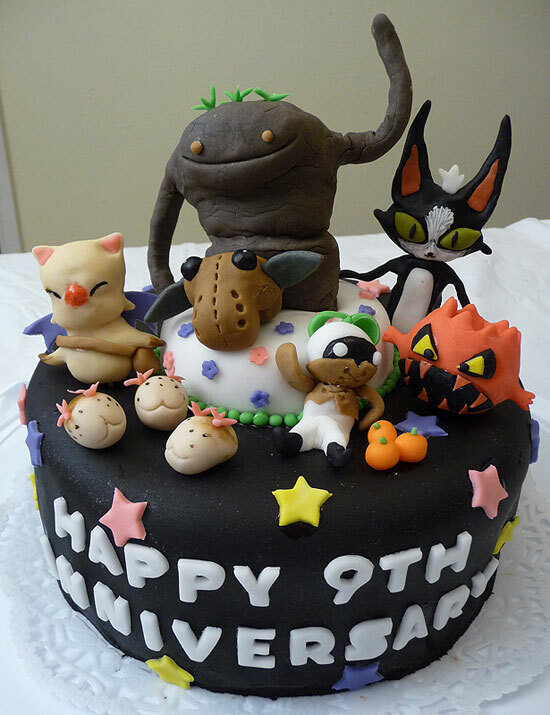 At this point, the goobbue is still standing ON the cake. That didn’t last long. He sank into it as time went on. I decided this could work in my favor and I could make like the goobbue was stomping through the cake. Here’s the mandragora sitting down, happy as can be. Time to work on Moogle, kupo~~! I colored this with one small application of chocolate brown to get a beige. I smoothed out his shape and pinched some ears. I stuck some pink into his ears, then painted his nose and eyes. I hated how those parts turned out, but oh well. I managed to make the eyes look a little better later by pinching the eye area a little. I used leftover brown from the gobbie to make the strap and pouch and added on little black feet. This unfortunately got lost when I added him to the cake as his feet got squished. I put some chocolate coloring on my fingers and bushed it onto his hands. Then I colored some fondant purple and make wings using an oval cutter and a teardrop cutter. Time for Cait Sith! This was the one I was dreading, but it turned out to be pretty easy. I shaped the head easily enough and added some red for ears. I used a toothpick to cut out where the eyes would go. I colored some fondant olive green by mixing green and brown and formed them into eyes. I added black slits, then glued them into the sockets. I took a small piece of white fondant and stuck it between the eyes, then used a toothpick tip to smooth around the white to look like Cait Sith’s white fur. I repeated the same on the mouth area. When I was done, I painted a nose and mouth on with a toothpick. Next I formed the body and shaped it around some white. I skipped the legs because I wanted Cait Sith to be peeking out and no legs would be needed. I stopped taking photos when I started on the leeches because I was just so freaking tired. I basically made some beige and then split them into three balls. I carved the mouth with a toothpick and then painted the back with my fingers. I added pink thingies to the top the same way I did the sprouts on the goobbue. I dotted spots on with a toothpick as a finishing touch. I started adding the other characters on and switched the bomb with Moogle to fill spaces better. The Goobbue’s arm was holding up nicely and it looked like he was happily waving to his mom or something. I then started to add stars, as they reminded me of my favorite firework, the Popstar. I started putting tiny flowers on the middle cake, which took a long time. The worst was the little green balls. The bottom of the little cake looked gross and unfinished, so I started making little green pebbles to put around it. Took. Forever. At the last minute, I decided to fill up the space in front of the mandragora with three little Saruta oranges. The bomb totally looks like he wants to eat them! In total, this took 8 hours, as I started at 8 PM and went to bed at 4 AM. We ate the cake tonight for dinner. Baby Girl made sure to confirm I would be saving her the figures to eat. That girl and her sweets, sigh! Hope you’ve enjoyed my tutorial. Sorry it was so long, but damn this cake was complicated! Next cake will probably be Baby Girl’s. I’ll need to start planning that one right away!